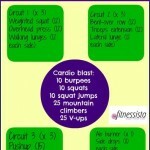 For today’s post, I wanted to share an all-new workout. 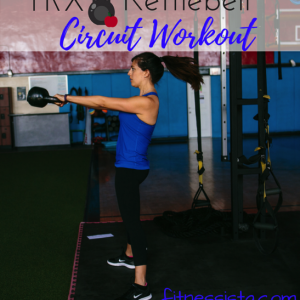 This one’s a kettlebell circuit, which will work your entire body and add in that extra core challenge from using the kettlebell. 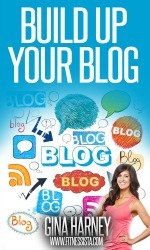 (You can check out a great post on kettlebell sport here!) As always, modify as needed and talk to a doctor before making any fitness changes. I can’t wait to hear what you think about it! Goblet Squat: Place your feet just under your shoulders with toes slightly angled out. Hold a HEAVY kettlebell under your chin. Keep your chest lifted and a tight core as you sink back and down into your squat. Pretend like there is a chair behind you, and you’re going to tap your booty to the chair. The weight should remain in your heels. Exhale and squeeze your glutes to rise. 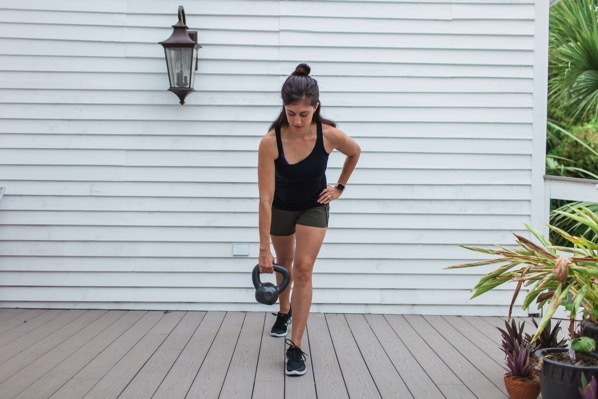 Side Lunge with Overhead Press and Knee Raise: Take a big step out with your right leg (holding the kettlebell), with your right foot angled out 45 degrees. (Your left leg stays straight and strong; toes point forward.) Think about sinking your hips down and back into your lateral lunge as you keep your core tight and your chest lifted. Exhale to step back towards center, and press the weights up overhead as you raise your right knee. That’s one rep. Single Arm Swing: Stand hip-width apart and hold the kettlebell in between your knees with one hand. Start to gently swing it so you can gain some momentum. When you’re ready, power through your hips, glutes and core to swing the weight up to shoulder height, then bend your knees, swinging it back to start. Remember that you are NOT using your arms to lift the weight; this is pure glute and core power. Every time the weight goes up, make sure you’re strongly exhaling. Lunge with Pass Through: Hold the kettlebell in your right hand, take a big step forward to come into a lunge position. Watch your alignment and make sure your front knee is stacked over your front ankle, and your chest is lifted with a tight core. Pass the kettlebell through to your left hand, then step back to start position. Repeat, alternating legs. Single arm wide row to narrow row: Hinge forward from your hips and step one foot back. Bring your weight to your front foot and hold the kettlebell in the opposite hand (pic above). Squeeze your back to bend your arm in next to your torso for a narrow row. Lower down with control, and exhale to come up to a wide row with your arm at a 90 degree angle. Russian Twist: Sit with your knees bent, feet on the floor for beginners or lifted off the ground for more challenge. Hold the kettlebell with both hands and twist your upper body to the right, bringing the kettlebell towards the ground, then twist the left. That’s one rep. Pro tip: DO NOT cross your ankles; that takes your hips out of alignment. What’s your favorite kettlebell move?? Do you live close to your fam/parents or nah? I love using the kettlebell for workouts but never really know what to do. Thanks for this! Looks great! 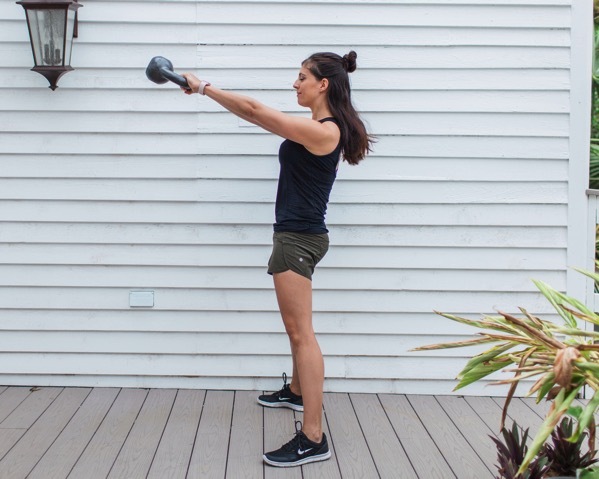 Yesss to kettlebells — those little beasts make for such a good workout! I LOVE the color of your shorts, too! I need to pick up a pair of those! Kettlbells are awesome! Love swings and then supersetting with plyo moves without the kettlbell…. 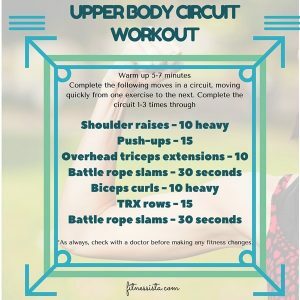 make a tabata style circuit like that! 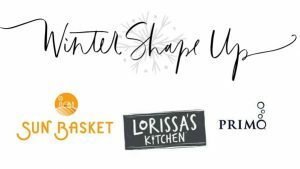 I didn’t know what I was in the mood for workout-wise when I got up this morning and then I checked my blog feed and saw this and immediately got my kettlebell out! It was awesome! 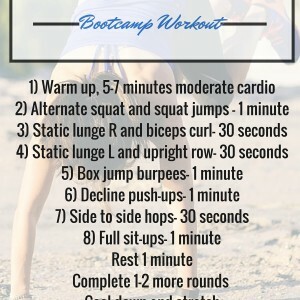 I did three rounds and my legs were on fire by the end. I always love your workouts!! so amazing! 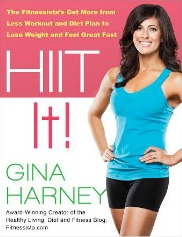 happy to hear you gave it a whirl and got in a good workout! I love kettle bell workouts! We live close to both our parents, something I did not really appreciate until I got older. Hope you have a great day! I’ve always wanted to try kettle bell workouts and this looks awesome! I’ve been wanting to add some kettle bells to our home gym for some time now. What weight do you recommend I get? yes! i like to use something lighter for single arm workout (anywhere from 10-20 lb depending on your strength training level) and something heavier for swings (i use 35 for swings). LOVE kettlebells! I recently did walking lunges with the kettlebells “racked” directly in front of my chest. Felt like I was using my arms and shoulders as well. ohh i like that idea! I love kneeling on one knee an doing shoulders raises on one side with a kettlebell. Such a good burn! I love the lunge with passthrough! I live very close to my parents and I’m so grateful. The husband’s are about 4 hours away so neither of us are too far! I bet it’s tough to say good-bye to your mom! So sweet of her to make the trip all the way across the country to visit. At least frequent visits make it easier to say “see you soon” instead of “see you later”! Love this! Thought on Russian Twist when one still has a bit of abdominal separation? 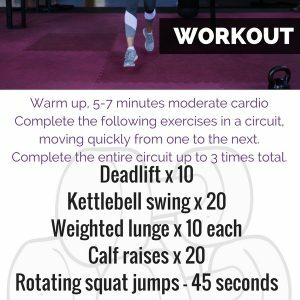 I love kettle bell workouts and do these regularly after I’ve done my running! They are so effective and I love the progress you get from such a simple routine. 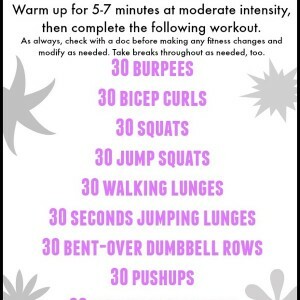 This looks like such a good workout! Will definitely be trying this out!